Born in Edinburgh, James Carron has been based in Dundee for most of his life. With the Angus Glens on his doorstep, he began walking there as a child and soon developed an enduring love for the area, exploring the hills and glens in all seasons and all weathers. In addition to day hikes, he also regularly embarks upon longer backpacking expeditions, camping out in wild and remote areas of the country. While James spends much of his time in the Scottish hills, he often makes forays overseas and has a particular passion for hiking in Eastern Europe. 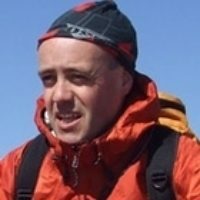 A freelance writer specialising in active outdoor pursuits, he has written a number of walking guidebooks and is a regular contributor to the Wild Walks section of TGO magazine, as well as to the Scotland Outdoors and BBC Countryfile magazines. He has had articles published in a number of others including Scotland Magazine, Scottish Memories, The Countryman and Camping.